Siobhan and Mouse, her 1993 Hanoverian gelding. Siobhan Byrne is a life-long horse lover. As a child growing up in the Pacific Northwest, she started riding lessons at the age of seven. She came up through the Young Rider program and upon graduating high school moved to San Diego to work with Steffen Peters and his then-assistant, Allyson Rogers (now of ALR Dressage.) After several years in California, Siobhan moved to New Jersey to attend Rutgers University, where she completed a degree in Philosophy. Her business name, “Qualia Dressage”, is a nod to her studies in philosophy. You can learn about qualia here. 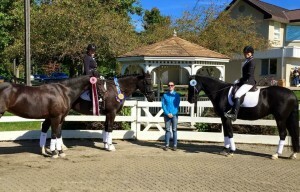 Siobhan and students at the 2015 CBLM Finals, who finished Champion, 5th and 10th in the Training A Final, and 6th and 8th in the First Level A Final. 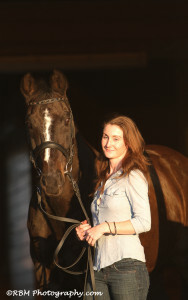 Siobhan has experience bringing both horse and rider systematically up the levels. Her students have earned USDF medals and championship wins and placings, in addition to learning how to have a better relationship with their horse. A sensitive and sympathetic rider, Siobhan is adept at figuring out what makes a horse tick, and bringing out their best. Some of her favorite horses are the unlikely ones she’s been able to bring up the levels. Siobhan is a firm believer in continuing education. She takes lessons from USDF Gold medalists Jessica Jo “JJ” Tate and Allyson Rogers, and participates regularly in clinics with top trainers such as Lars Petersen, Jeremy Steinberg, and Olivia LaGoy-Weltz. She has also participated in clinics with Arthur Kottas, Georg Theodorescu, Conrad Schumacher, Christoph Hess, and Charles de Kunffy. Siobhan is also an alumna of the Hassler Dressage/Harmony Sporthorse Young Dressage Horse Trainers Symposium. Her students are consistently in the ribbons locally and regionally, and she has helped several students earn USDF medals. Relocated to Maryland in 2007, Siobhan has since worked as an instructor and trainer in the greater Washington, DC area. She works out of beautiful Locks Edge in Poolesville, Maryland and accepts horses in full and partial training there, as well as haul-in lessons. She is also available to travel to ride and teach in the surrounding areas of Maryland and northern Virginia on a limited basis. 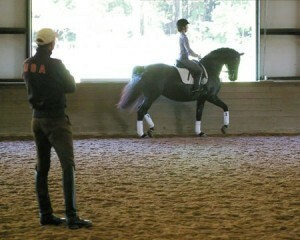 Siobhan riding Baronessa with Steffen Peters in a clinic at Chesapeake Dressage Institute.